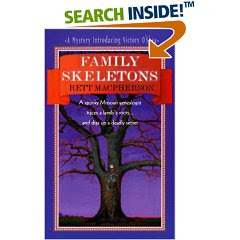 After reading Family Skeletons by Rett MacPherson, I'm starting to realize the importance of bringing a list when I go to the library. This is one that I picked at random, because I liked the cover art (the library edition has a different cover) and the premise sounded interesting. I just wish the story had delivered. This is the first book in a series featuring Victory "Torie" O'Shea, the resident historian of small town New Kassel, Missouri. When the story opens, she's busy working as a tour guide during the town's festival honoring its German roots. Although Torie has her hands full with her work at Gaheimer House, a historic home turned museum, she's intrigued when Norah Zumwalt comes to her asking for help. Norah, a local shop owner, asks Torie to trace her family tree. Specifically, she wants help finding her father, who left for WWII and never came home. Torie gets to work, discovering that not only is Norah's father alive, but also living in a nearby town. Armed with this information, Torie eagerly sets out to tell Norah, but the woman seems to have disappeared. When Torie drives to Norah's house, she finds the bloody corpse of her client. The experience shakes Torie up, but also hardens her resolve. She must solve Norah's family mysteries and figure out what secrets were damning enough to cause the woman's death. Torie's nemesis, Sheriff Colin Brooke, is also on the case. Although Torie provides him with some useful information, the sheriff is not happy to have her as his unofficial assistant. Reluctantly, the two work together, digging up secrets someone doesn't want unearthed. Despite warnings to back off, Torie can't keep away from this intriguing case of mistaken identity, murder and family relationships that are, well, murder. Like I said, I thought this book had a fun premise. I love the idea of a genealogist finding mysteries in people's family trees, and thought it would make a good story. And it would have in the hands of a better writer, or a more attentive editor. The writing is just clumsy, with awkward sentences and a sloppy plot. The characters in the novel are equally as weak. I found Torie downright unlikable. She is caustic, cold and not sympathetic in the least. The minor players were shadows and/or cliches. As for the mystery, I thought it was unimaginative and predictable - the murderer was so obvious that I dismissed the character outright, thinking there was no way he/she would turn out to be the villain. Of course, in the end, Torie walks right into the killer's trap, where she coerces the truth out of the bad guy (or girl) and solves the case. I realize this is the first book in the series, and maybe the subsequent books are better than this one. Maybe I'll take the time to find out, maybe I won't. Hey Susan! You won a Kathy Herman book! Email me your address and I'll get it sent off right away. Congrats! Thanks so much, Amanda. I'm sending you an email now! Wow, this really is my lucky month. Thanks, Katrina, I'm really excited about my win! !